Who are the alchemists of our time, actually? The way we see it, they’re the creative ones whose hybrid working methods are overriding the borders between art and science, opening up completely new prospects thereby and drawing trailblazing conclusions from they’ve seen—the interdisciplinary, international teams of artists, scientists, designers and engineers who are now at work on the future of 3-D printing, genetic engineering, artificial intelligence, self-driving vehicles, nanotechnology and lots more. The “Alchemists of Our Time” exhibition at this year’s Ars Electronica Festival spotlights a new generation of artists and researchers—what they’re working on and how they’re going about it. This show will be running in the spacious halls of POSTCITY on the grounds of Linz’s main train station. The composed mega-portraits are disturbing. 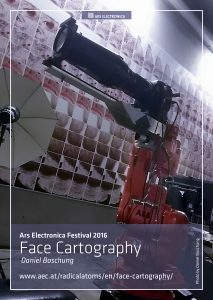 Face Cartography is the Swiss publicity and news photographer Daniel Boschung’s latest project. He maps faces. Instead of taking pictures himself, he removes himself from the process by delegating the work to an ABB industrial robot controlled by specially customized software. The standardized portraits make a surprising impact. Each picture consists of about 600 single shots comprising 900 million pixels. The result is hype-realistic. Stubble turns into a trunk, a wrinkle into a canyon, a nostril into a cavern. These facial landscapes are dismaying—why? Emotions are completely absent. They appear only briefly, while macro photography takes half an hour. The human subject has to remain motionless while being photographed by the robot.